This post is part of my series on organizing “between and beyond.” Other posts are here. The purpose of this post is to explore the history and key assumptions of Sociocracy and Holacracy®. 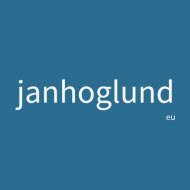 The post is based on my previous posts about Sociocracy and Holacracy. The analysis is summarized here. I first heard about Sociocracy and Holacracy in 2012. Both attracted my interest and I wrote an enthusiastic book review of We the People: Consenting to a Deeper Democracy by John Buck and Sharon Villines in November 2012. I subsequently participated in several Sociocracy workshops with James Priest, got training in facilitating Sociocracy by The Sociocracy Consulting Group, and wrote an ebook on Sociocracy (in Swedish), Sociokrati: En metod för självstyre, together with John Schinnerer. Endenburg and Robertson have very different views on organizations and their purposes. Endenburg thinks that organizations exists for the people,5 while Robertson views the organizations as separate entities that have their own purposes beyond just serving people.6 Endenburg emphasizes the importance of each person’s equivalence in the decision-making and the potential for existence and development,7 while Robertson views people as role fillers8 and differentiates between role and soul.9 Robertson’s favorite metaphor to illustrate dynamic steering and constant weaving is riding a bicycle.10 Endenburg uses the same metaphor to illustrate weaving and the circle process.11 Both use nested circles which are linked via two separate roles.12,13 In short, both use the same basic rules, or principles. Sociocracy and Holacracy are based on specific assumptions applicable to mechanical and electrical systems. Endenburg uses two examples to illustrate the feedback control loop, or circle process, in cybernetics. The first example is, as already mentioned, riding a bicycle.16 The second metaphor is a central heating system.17 Endenburg acknowledges that the operating limits in riding a bicycle are different from those within a heating system, but he still thinks that they indicate constraints within which control may be exercised.18 Endenburg is aware that riding a bicycle is far more complex in reality than his simple example might suggest.19 He also acknowledges that people are not system components,20 but he doesn’t distinguish between machines and organisms in his reasoning.21 Neither does Robertson, who views people as sensors for the organization.22 But people are not machines (or sensors). Machines and organisms ARE different. 1 Gerard Endenburg’s first book on Sociocracy was originally published in Dutch in 1981. The first English translation was published in 1988. The Eburon edition was published in 1998. See Gerard Endenburg, Sociocracy: The organization of decision-making (Eburon, 1998). 2 Holacracy is registered in the US Patent and Trademark Office. Brian Robertson’s book on Holacracy was published in 2015. 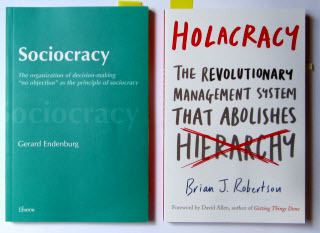 See Brian J. Robertson, Holacracy: The Revolutionary Management System that Abolishes Hierarchy (Penguin, 2015). 3 Endenburg, Sociocracy, p. 5. 4 Robertson, Holacracy, p. 7. 5 Endenburg, Sociocracy, p. 142. 6 Robertson, Holacracy, p. 148. 7 Endenburg, Sociocracy, p. 167. 8 Robertson, Holacracy, p. 92. 11 Endenburg, Sociocracy, pp. 16–19. 12 Ibid., pp. 10–11, 26–27. 13 Robertson, Holacracy, pp. 46–56. 15 Arthur Koestler, The Ghost in the Machine (Last Century Media, 1982, first published 1967), p. 48. 16 Endenburg, Sociocracy, pp. 16—19, 23, 33—37, 223—224. 17 Ibid., pp. 19—23, 30, 36, 40. 18 Ibid., pp. 23, 30. 22 Robertson, Holacracy, pp. 4, 166, 198. 23 Robert Hartman, Freedom to Live: The Robert Hartman Story, p. 67. 25 Robertson, Holacracy, p. 34. 30 Robert Hartman, Freedom to Live: The Robert Hartman Story, p. 124. We may properly view “holacracy” as a very prescriptive instantiation of the empty [sociocracy] framework. In other words, “holacracy” fills in the empty [sociocracy] framework with various implementation details, and is much more brittle (harder to implement) for this reason. It has loads of rules, and implementing it is an “all or nothing” choice. Many of the design decisions that are required in [sociocracy] are now made for you, in advance, by the designer of “holacracy.” If you like central planning and a one-size-fits-all approach, “holacracy” might be perfect for you. The “holacracy” system is also typically implemented as an authoritative (“authoritarian”) mandate by executives. The mandate of “holacracy” at Zappos is an obvious example. Those who are required to make “holacracy” work do not typically play any part whatsoever in the process of choosing it. This tends to reduce engagement, and may even increase strong feelings of resentment and resistance.